After years of customer requests, GT Imports opened an affiliated business, GT Import Auto Sales in 2006. We specialize in quality pre-owned Hondas and Acuras. Every one of the cars on our lot has been subjected to our rigorous 120 point inspections to make sure that it meets our tough standards. And we offer a 3 year / 36,000 mile warranty and $500 voucher for first year service. 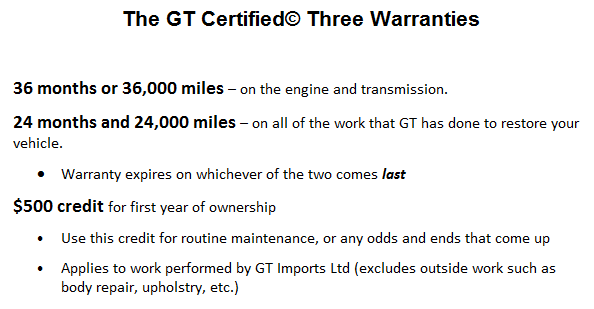 Also, all of the prep work we have done to bring the vehicle we sell to the GT Certified Standard is under a 2 year/24,000 mile warranty (whichever interval comes last)! We welcome you to take a look at the fine selection of pre-owned Honda cars, trucks and mini-vans. And if you don’t see the Honda or Acura you are looking for, please let us know at [email protected] or give us a call and we will see if we can find what you are looking for. At GT Imports Auto Sales, our motto is: The Customer is #1.